It’s a great honor for me to be invited here as a guest blogger. 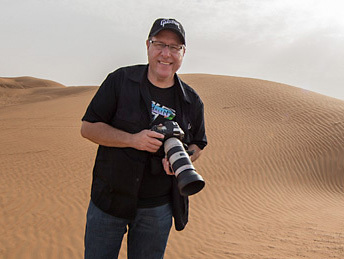 In my early years learning photography, well over ten years ago, the first photography books I purchased were from Scott Kelby’s Digital Photography series. My love for landscape photography began while I was living on the Southern Oregon Coast for many years. It’s there that I developed my skills as a landscape photographer, on the local beaches and throughout the forests in the Pacific Northwest. Spending time in nature has always been a part of my life since my early childhood years. For these reasons I’m passionate about photographing nature. During the last four years I’ve been traveling full-time in an RV with my husband. My goal has been to photograph places I’ve never been before in the western states. I’ve spent a lot of time photographing deserts and mountains, but my heart always comes back to the Pacific Northwest where my favorite landscape scenes are. To get this shot of Elowah Falls in Oregon, I needed to wade into the stream and get up on a boulder to get this composition. Spring is right around the corner, so I thought I would write about one of my favorite things in nature to photograph, waterfalls. In this post, I’ll share with you some tips on photographing flowing water during the springtime. The water run off can be pretty intense in the spring so hopefully these ideas will help you get the best images while out in the field. Being from the Pacific Northwest, I’m not afraid of the rain. I love going out to photograph waterfalls on a cloudy, drizzly day. For me, I feel these are the best conditions for photographing flowing water. The foliage around waterfalls most likely will be moist and lush looking. The moss and forest floor will pop with color. Springtime can also bring foggy conditions. When mixed with a little bit of light, this can create some magical moments. Be prepared for any kind of conditions by wearing layers, preferably non-cotton. This will work best in moist and still cool conditions. The proper footwear is important too. Bring boots, waders, or neoprene socks for under your boots for getting into the water. When it’s safe to do so, you’ll get much more interesting photos if you are willing to get into the water. A sturdy tripod is important for getting the sharpest images and slowing down the shutter speed to get some nice long exposure images. Bring along plenty of lens cloths to wipe away the spray from your lens. Invest in a good camera sleeve to protect your gear from water damage. Getting down low to capture Lower Kentucky Falls in the Oregon Coast Range. Springtime in State or National Parks can be a busy time with lots of tourists. It can make it hard to get the shot you want without people. Sometimes because of my travel schedule, I can’t avoid the crowds because I might have limited time to visit the area. I have found it best to avoid the weekends and definitely holidays. Be patient and allow people their opportunity to take their picture. I try not to take too much time photographing when there are people waiting to get their shot in the same position. Bridalveil Falls in Yosemite using a telephoto lens during mid day. When I’m out photographing waterfalls, I will usually start with taking both horizontal and vertical shots with my wide-angle lens. Once I am satisfied that I have the images I want, I enjoy wandering around to scout for other possible compositions. Take your time. To me, the exploration is the most enjoyable part of landscape photography. Just being outside and experiencing the sights and sounds of nature has such a calming effect on me. Change out that wide-angle lens with a telephoto to capture intimate or abstract scenes. Experiment with black and white. The creative possibilities are endless. For this intimate scene I zoomed in to capture a portion of a waterfall. Filters are a must for me. I bring my circular polarizing filter and a neutral density filter. The circular polarizing filter will help reduce the glare in the water and on the rocks. Along with your camera settings, the neutral density filter will help to slow down the shutter speed so you can get that beautiful silky look to the flowing water if that is your style and preference. Experiment with the look you like when using your filters. I often just use the circular polarizing filter for reducing glare and bringing out the colors more. I may even stack both the circular and neutral density filters depending on the situation. My goal in some cases may be just to freeze the motion of the water to show the power of nature. In that case, I might remove the filters. Close up of ripples in the creek below the waterfall. I hope you get a chance to get out this spring and photograph waterfalls. As mentioned, the most enjoyable part of photographing flowing water is getting out in nature. Hiking trails to get to the waterfall and the exploration makes the whole experience even better. Be safe out there and have fun! Lower Kentucky Falls in the Oregon Coast Range. You can see more of Patricia’s work at PatriciaDavidsonPhotography.com, and keep up with her on Facebook, Instagram, YouTube, and Twitter.